Jade is a HUTAC friend and Partner Manager. In her role, she is responsible for establishing and reinforcing partnerships with education and professional development organisations such as the Dutch Ministry of Education, Culture and Science; the Dutch Organisation for Internationalisation in Education; Holland Alumni Network; Fulbright Alumni Association; the Ivy Circle. Jade has a Bachelor’s degree in International Business Administration from the Rotterdam School of Management, and two Master degrees in International Management from the Rotterdam School of Management and the Copenhagen Business School. She has extensive experience in working with (inter-)governmental and nonprofit organizations (incl. 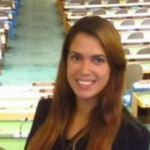 the UN, and the European Youth Parliament) and works as a Senior Team Manager at Shell. In her free time she enjoys venturing out to the furthest corners of the world and has lived in eight countries on five continents.